Maine Gov. 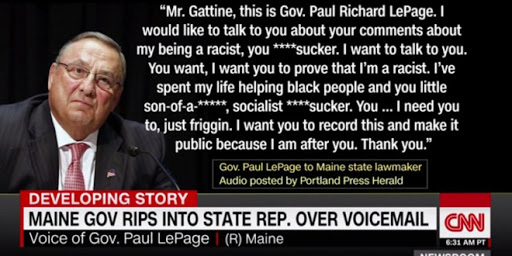 Paul LePage is getting attention this morning after a recorded phone call he made has come to light. In the phone call, made to Democratic State Rep. Drew Gattine on Thursday, the bombastic Republican ripped off a series of gay slurs in an angry rant. "Mr. Gattine, this is Gov. Paul Richard LePage," the audio recording says. "I would like to talk to you about your comments about my being a racist, you (obscene term). I want to talk to you. I want you to prove that I'm a racist. I've spent my life helping black people and you little (obscene term), socialist (obscene term). You -- I need you to -- just friggin'. I want you to record this and make it public because I am after you. Thank you." It may come as no surprise that LePage is an ardent supporter of Donald Trump. In an interview today, the governor also said if this were 1825 he would challenge Gattine to a duel and shoot him between the eyes.